Matthew Myers, Long Island Regional Supervisor/Bureau of Public Works at New York State Department of Labor. The Department of Labor plays a major role in strengthening New York State’s economy by connecting job seekers to jobs, supporting businesses in hiring, assisting the unemployed and protecting workers. That is the agency’s mission. Marc Herbst Executive Director of the LI Contractor’s Association (LICA) located in Hauppauge, NY. The Long Island Contractors’ Association, Inc. (LICA), is a nationally regarded advocacy organization that seeks increased funding of our region’s infrastructure. Michael Ingham, partner in Carman, Callahan & Ingham, LLC (Farmingdale, NY) and General Counsel to the Long Island Water Conference (LIWC). Mike has been general counsel to several local municipalities for many years and specializes in complex insurance coverage litigation and Appellate Practice. 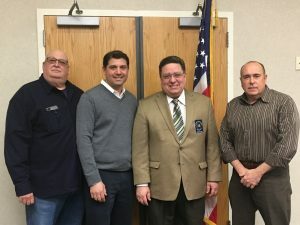 L To R: Commissioners Bill Schuckmann (Hicksville), Michael F. Rich III (Oyster Bay) and Andrew N. Bader (Plainview), Mr. Matthew Myers. 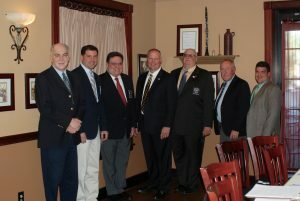 L To R: Commissioners Kenneth P. Wenthen, Jr. (West Hempstead),Michael F. Rich (Oyster Bay), Andrew N. Bader (Plainview), Mr. Marc Herbst, Commissioner Bill Schuckmann (Hicksville), Michael Ingham and Commissioner Vincent Abbatiello (Westbury).